While going through some of the pictures that I took during my visit to Salem last month, I came across a couple that made go "hmmmm ..." as there was something on them that I couldn't really seem to easily explain. Now granted, I'm pretty sure that whenever anyone goes to Salem they're hoping to get pictures that have unexplained spots on them but I really wasn't looking for anything like that as when Jamie and I were walking around it was about 4:00 in the afternoon and the last thing I was thinking of was perhaps capturing a ghost out for an afternoon stroll or something like that! What I was looking for were pictures of some nice front doors as I rather like front doors as well as other aspects of nice architecture. I think a front door speaks volumes about a house in general and I'm a sucker for a house with a nice front entryway. 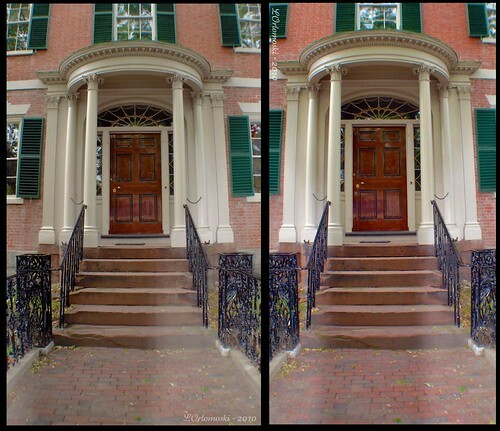 Sadly, classy front doors and entryways have pretty much gone the way of the horse and buggy but back when they were building houses in Salem, they sure knew how to make a good first impression with their front door! At least those folks with money did and due its success as a seafaring town, Salem had more than its fair share of wealthy sea captains and merchants who could afford to build nice houses and nice front entrances. This is the Gardner-Pingree House which was built for John Gardner Jr., a wealthy Salem merchant, and his wife Sarah in 1804. 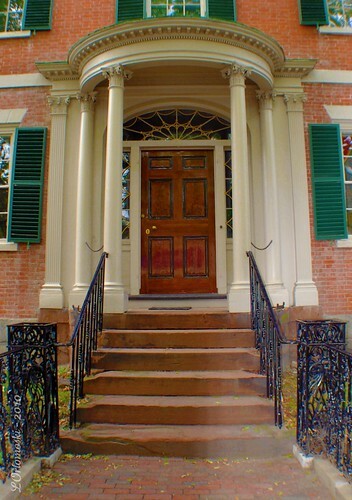 The home was designed by Samuel McIntire who was one of the earliest architects in the United States. Born in Salem in 1757, McIntire was a woodcarver by trade but he went on to become one of the most celebrated architects of his time. He specialized in the Federal style of architecture which got its name from the Federalist Era - a time period in American history from roughly 1789 to 1801 when the Federalist Party was dominant in American politics. The Federalist Party, aka our Founding Fathers, chose to associate the nation with the ancient democracies of Greece and the republican values of Rome and consquently the architectural style - balanced and symmetrical - followed suit. Samuel McIntire had an innate sense of proportion and attention to decorative detail which can be seen to this day by visitors to the house which now belongs to the Peabody Essex Museum. In addition to the Corinthian columns on the semicircular portico (that entryway I'm so enamored of) there are neoclassical ornaments on the mantels and the door-frames as well as the furniture in the double parlor. The Gardner-Pingree House is said to be the finest surviving example of the many Federal style houses built in Salem between 1793 and 1825 but it has a bit of a dark past, too. 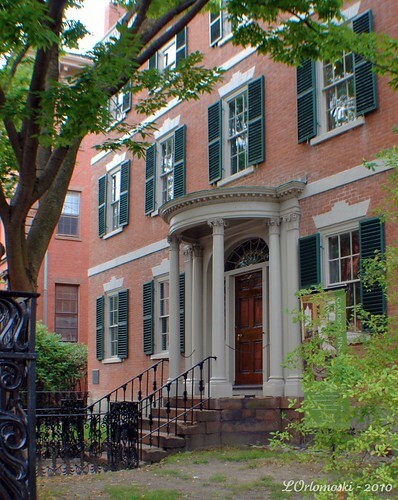 You see, the Gardner-Pingree House is actually the Gardner-West-White-Pingree House as the house was sold in 1811 to Nathaniel West when John Gardner had some financial difficulties. Three years later, West sold the house to Captain Joseph White, a wealthy, retired merchant. Captain White lived in the house with a manservant and his niece, Mrs, Beckford, who worked as his housekeeper and who had a daughter that lived in Wenham, Massachusetts and was married to Joseph J. Knapp, Jr.
One day Joseph learned that the 82-year old Captain had made out a will leaving $15,000 to Mrs. Beckford and it was then that he got the idea that if his great-uncle-by-marriage were to die without a will, that his mother-in-law would then inherit half of Captain White's sizable fortune instead - an amount that was nearly $200,000 - and by default some of that fortune would then come to him. Being an ambitious and impatient man, Joseph conspired with his brother John, another ambitious and impatient man, to hire a local criminal by the name of Richard Crowninshield to hurry his great-uncle along to his grave, On the night of April 6th, 1830, Captain White was brutally murdered after Crowninshield entered the house through a window that had been left open by Joseph earlier in the day, went to the bedroom where Captain White was sleeping, and fractured the Captain's skull with a club as well as stabbing him thirteen times with a long dagger. The murder shocked the town of Salem and even inspired Nathaniel Hawthorne to write about it in his short story, "Mr. Higginbotham's Catastrophe". The court case that followed is actually a rather interesting one as the Knapps were prosecuted by the great Daniel Webster, one of the most successful lawyers of the era, who was primarily a defense lawyer but also known to serve as a prosecutor from time to time. Webster's courtroom skills and persuasive oration eventually set legal precedent and the two brothers were found guilty and hanged for their role in the crime. Their hired-man Crowninshield had already committed suicide early on when he realized he had no hope of getting away with the murder. If you'd like some interesting reading, you can find the court case from 1830 here. 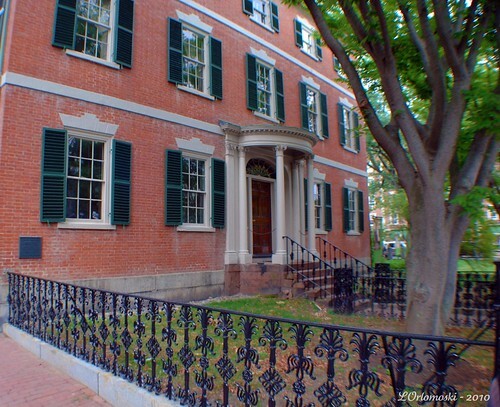 In 1834, the house was sold to David Pingree with the ownership of the house remained in the Pingree family until 1933 when it was donated by the Pingree heirs to the Essex Institute - which later merged with the Peabody Museum to become the Peabody Essex Museum. Today the house is one of the stops on the many ghost tours that one can take in Salem as the house is believed to be haunted due to the circumstances surrounding Captain White's death. 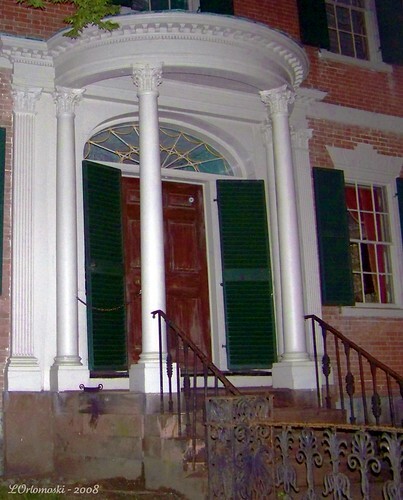 People claim to see ghostly faces looking out of the second floor windows and many have claimed to hear ghostly footsteps while touring the house. As a matter of fact, when Amanda, Darci, and I were in Salem in October of 2008 with our friend Amy, we went on one of the night ghost tours and one of our first stops was the Gardner-Pingree House. The picture above was taken on that night tour and shows a small orb near the top right-hand side of the front door - a rather odd-looking orb when you get right down to it but then again, there is no exact science when it comes to orbs. The picture has been languishing in the pile of pictures I have in my Flickr account and I really hadn't given much thought to it until I was going through the pictures from my last trip to Salem. Having a memory like a sieve these days, I knew that one of the houses on Essex Street was supposed to be haunted but I didn't really remember which one as Jamie and I walked along and took pictures. In all honesty I thought it was the house next to the Gardner-Pingree house but when I looked at the following pictures, I did a little research, dug through my picture files, and exclaimed "Oh yea! It was that house!" The two pictures above were taken at the exact same time as I tend to have my camera set on continuous shooting mode for some strange reason; I think it was a habit I got into while trying to take pictures of trains. At any rate, see that slightly foggy area to the sides of the steps? I can think of no good reason as to why that's there in those pictures as there was no sun that would have caused reflections, it wasn't a humid day, nor was it a foggy day. And nowhere do I have that sort of effect on any of the other 200+ pictures that I took that afternoon. Now I'm not saying that those foggy areas are definitely something paranormal or supernatural but I am saying that I can't think of any good reason as to why they're there and the house does have a rather interesting history. Needless to say, when I saw those pictures it gave me pause and that, my friends, is what ghost stories are generally made of! that is awesome! We visited Tombstone, AZ a few years back and there were MANY orbs in my shots. I have never had that problem before, and they were also unexplainable. Great post! Great history about the house and the orb and foggy areas on the photos are interesting. I'd love to visit Salem. I believe we have a ghost posing in these shots! That 'splains it. I'm not one who is "into" ghosts and such -but I do love your stories about these things cause you do go into so much historical detail in 'em -however, that side-by-side house photo with the misty-cloudy effect could darned near make a believer of me. Got me hearing the "do-do, do-do" music in my pea brain now for sure! It's the oft' mentioned but never understood "Shadow of Doubt'! hahahaha! They just don't know how to build anything nowadays, do they? A great story. There must be so many interesting places in Salem. Well, when I quickly glanced at the first photo when your page came up, my eye told me there was a figure standing in the downstairs window to the right of the front door. It's clearly some kind of reflection, or perhaps something innocuous placed in the room, but my eye played me a trick on first look. i really like these period pieces and all of your hard work with the history, et al. Don't you just love the "spider web" effect of the windows over the door? Our modern buildings are so blah and shabby. What a shame.